Incense Stick Size 8" to 12"
Capacity up to 2700 pouch/HR. 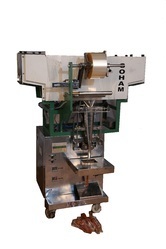 Machine Speed up to 2700 pouch/HR. (Depends on size & Qty). Counting System with Stepper Motor. Machine Auto stop when raw incense was finish. Length of packing 8" to 12"
Diameter of Incense 2.8 mm to 3.5 mm. Packing Roll width 80 to 180 mm. No. of sticks 1 to 75 sticks/pouch. Film Thickness 0.02 -0.04 mm. Warranty 9 months in Main motor, Ac drive, PLC and stepper motor. You have buy extra suite for big pouch is Chargeable.